"Extend Volume" is grayed out. The reason is that you can extend a partition in Disk Management only under the condition that there is adjacent unallocated space. 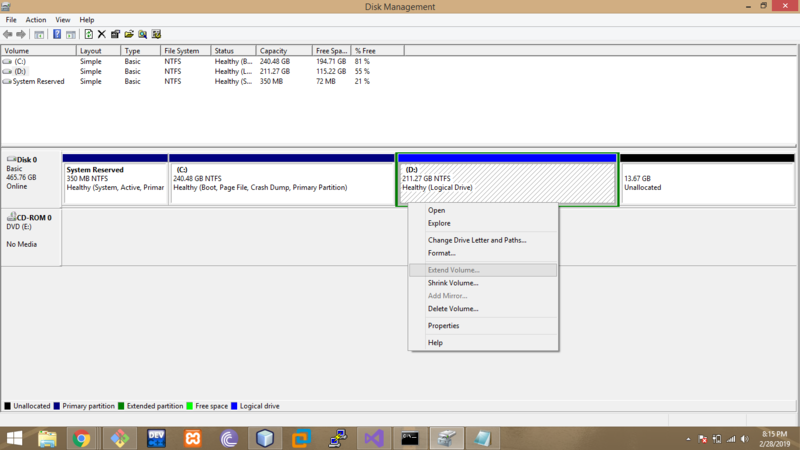 Why cant i extend volume even if the unallocated space is right next to the partition i want to extend. Why is extend volume greyed out still? P.S I found this but couldn't completely understand it can someone explain this to me. the extended partition can contain any number of logical drives. You're trying to resize the logical drive. Logical drives must be contained in the extended partition. There's no more space in your extended partition, so you can't extend the logical drive. Extend the extended partition into unallocated space. This will make unallocated space available for the logical drive. Not the answer you're looking for? Browse other questions tagged windows hard-drive partitioning or ask your own question. How to extend NTFS partition onto multiple disks in windows 7?